I have to review this before I plunge into the next book in the trilogy. I've never read a satisfying story about the myth of Atlantis, until now. 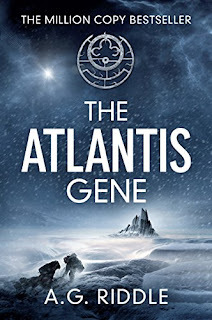 It's no wonder that The Atlantis Gene is a million copy bestseller, and could be a movie soon. The journey of A.G Riddle and this book is an inspiration to self published authors. This book was initially self published. The Atlantis Gene connects so many unanswered mysteries. Was there really an advanced race that disappeared under the ocean like Plato said? Where is the missing link? Why did homo sapiens suddenly move to the top of the food chain, called The Great Leap Forward? Why not the Neanderthals who were stronger and had bigger brains? Did someone interfere eons ago? Did they somehow manipulate our genes? Were we visited by more advanced beings? What if it was all true? How do we deal with that information.... Yummy questions to ponder. It was so delicious for someone like me, who loves reading about these topics. The theories presented in this book was so well mixed with the facts it doesn't sound too farfetched at all. There are so many things in history we do not know. Someone said, we are a race with amnesia, and I believe that. Which is why I'm hungry for knowledge, and not just the mainstream kind. One of the best books I've read in my lifetime on the Atlantis topic. Definitely deserves the credit it's receiving. I've read the negative reviews and my opinion is... just enjoy the story. Did I enjoy it? Yes. Was it a perfectly written book? No, but the errors mentioned were not enough to distract me from the story. Were some of the scenes too preposterous? No. It's a fantasy for heaven's sake. Was it too ambitious? Absolutely. That's why it was so fun to read. A recommended read for scifi fantasy thriller readers. This is a treasure trove of goodies. Action and science combined, all the way. Reading Book 2 now, and I'm hoping the sequel can match this. On Supporting Indie Authors on Twitter: Trick or Tweet? Twitter Book Promoters: Which ones are worth the time and money?